For many years thought to represent Lady Jane Grey, the painting has recently been re-identified as Catherine Parr, with whose name it was originally associated. The full-length format was very rare in portraits of this date, and was usually used only for very important sitters. 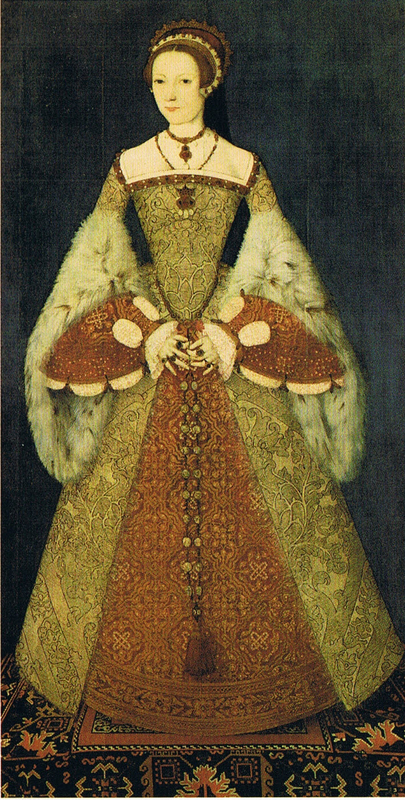 Lady Jane Grey, although of royal blood, was a relatively obscure child of eight when this was painted; it was to be another eight years before her disasterous and short-lived reign. The distinctive crown shaped jewel which the sitter wears can be traced to an inventory of jewels belonging to Catherine Parr and the cameo beads appear to have belonged to Catherine Howard, from whom they would have passed to her successor as queen.